The pharmacological targeting of microcirculatory dysregulations is a therapeutic strategy for the treatment of numerous pathological conditions, such as cancer, thrombosis and inflammation. A promising candidate for this purpose is indole-3-carbinol (I3C), a phytochemical compound of cruciferous vegetables, and its main derivate 3,3,’-diindolylmethane (DIM). 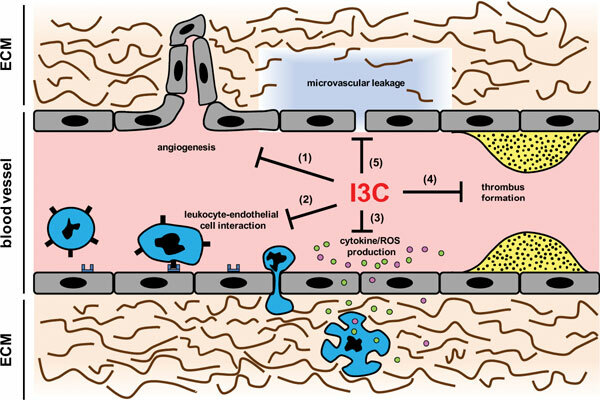 As summarized in this review, I3C and DIM affect multiple molecular and cellular processes within the microcirculation due to their pleiotropic action profile. These include angiogenesis, leukocyte-endothelial cell interaction, cytokine and reactive oxygen species (ROS) production, thrombus formation and microvascular leakage. Hence, I3C may serve as a lead compound for the future chemical synthesis of novel drugs that exert comparable beneficial effects while exhibiting an improved bioavailability. Angiogenesis, endothelial cells, indole-3-carbinol, inflammation, microcirculation, leukocytes, reactive oxygen species, thrombosis.